George, Madison, Albert, Francis and Joseph Sullivan of Waterloo, Iowa, became known nationwide after they enlisted in the Navy and requested the ability to "stick together" while in the service. All of the brothers gave their lives in the defense of their country when the U.S.S. Juneau, on which they were serving, was sunk due to enemy action in November 1942. 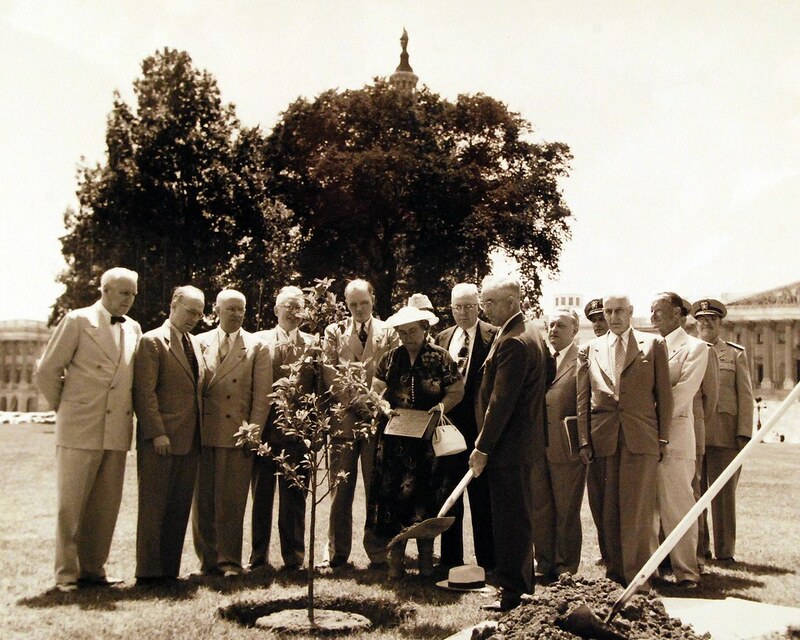 In 1952, one crabapple tree was planted on the Capitol Grounds for each of the five Sullivan brothers. Those present at the tree planting ceremony included Mrs. Sullivan, Senator Guy Gillette of Iowa and Congressman Harold Royce Gross of Iowa. Photo courtesy of the National Museum of the U.S. Navy. The most significant ornamental feature of these trees is the light pink flowers appearing in April that initially start in bud as crimson red. After about 50 years, the original trees were severely declining and gradually being lost. In 2005, cuttings were taken, grown by the U.S. Botanic Garden and later planted at this current location.